Tad Williams: The American Tolkien? Tad Williams’ Memory, Sorrow and Thorn has been called ‘the fantasy equivalent of War and Peace‘ and it is easy to see why. Epic in every sense of the word, this series clocks in at around 4,000 pages in paperback (the final volume To Green Angel Tower had to be cut in two because it was too big to be published as a single paperback). Despite its length, the series never feels padded or plodding – instead it is one of those rare stories that totally engages you to the extent that you feel that you are ever bit as much a part of Williams’ world of Osten Ard as the characters. I recently re-read the whole of Memory, Sorrow and Thorn and what struck me for the first time was how much of a debt the fantasy authors that came after Williams owe to his work. George R R Martin’s A Song of Ice and Fire series has won plaudits from every corner but I have to say that in my view the foundations and first floor of his series were laid by Williams (Martin himself has indicated that he was heavily inspired by Memory, Sorrow and Thorn). Although much of Williams’ writing itself owes a debt, inevitably, to J R R Tolkien’s Lord of the Rings, it is in Memory, Sorrow and Thorn, perhaps for the first time, that we truly see an adult take on the genre of epic fantasy. Expectations are turned over, beloved characters suffer (and die, over and over again) and the fantasy world that is presented is every bit as gritty, believable and sometimes unpleasant as our own. 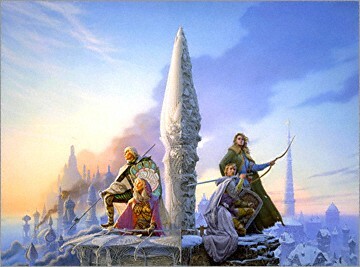 Echoes of Williams’ work can also be seen in the books of those other giants of the fantasy genre, Robin Hobb, Terry Goodkind and Robert Jordan, as well as those of Martin. The series starts with The Dragonbone Chair, which was first published in 1988. Even now, however, very little about Williams’ writing appears dated or old-fashioned, although the story starts traditionally enough. Rather than pummelling you with the action straight away, which seems to be the norm for fantasy novels these days, the book begins slowly. We are introduced to the fantasy realm of Osten Ard, which is ruled from the grand castle of the Hayholt by the High King Prester John, and the hero Simon, a kitchen boy in the castle and apprentice to the magician, Doctor Morgenes. As the story goes on the status quo is forever changed by the death of the king and the subsequent power struggle between his sons, Elias and Josua, while in the north a supernatural threat looms. As mentioned above, there are many similarities between Williams’ story and Martin’s A Game of Thrones – the concept of inhuman ‘white walkers’, feuding princes, a murdered King’s Hand, dragons in the past and present, and even the tradition of rubbing dwarf’s heads for good luck! – although admittedly these are many of the stock tropes of epic fantasy across the board. What is more marked is the similarity to Robert Jordan’s writing – the same engrossing style, heavy on description with appealing central characters and a layered history. The crucial difference is that there are never more than half a dozen viewpoint characters in any of the novels that make up Memory, Sorrow and Thorn, which I feel is important because it ensures that we as readers stay involved and care about what happens to protagonists whom we come to know well. Also, in another change from many modern fantasy novels, you feel that the author has a clear plan from the outset about where the series is going rather than simply dragging the story out for the sake of it, as happens so often nowadays, limiting it to four books rather than a dozen. The middle novel in the series Stone of Farewell is in my view the best of the bunch because, without giving the story away to those of you who haven’t yet read it, in many ways it is The Empire Strikes Back to the first book’s Star Wars – darker, more mature and in many ways more heartbreaking. In this book the characters whom we have come to care about a great deal are really made to suffer and grow – facing hardship, loss and great danger. Having already made the War and Peace comparison, I’m giving nothing away by saying that not all of the characters make it to the end of the book and that even more are lost during the course of the series’ devastating conclusion To Green Angel Tower. I hope that this does not put anyone off reading Memory, Sorrow and Thorn though, because I promise you that if you make it to the end you will find it a fulfilling achievement. Even better, there is plenty more Tad Williams to read in the form of his other series, which are equally lengthy. There are the one-off novels Caliban’s Hour, Tailchaser’s Song and The War of the Flowers, as well as the award-winning ‘virtual reality’ series Otherland. I suspect that the books that fans of Memory, Sorrow and Thorn will most enjoy, however, are those of the Shadowmarch sequence, another epic fantasy series. I’ve always thought of Shadowmarch and its sequels, Shadowplay, Shadowrise and Shadowheart as a sort of unofficial sequel to Memory, Sorrow and Thorn, even though it is set in another world, as it has many features in common with Williams’ earlier series – a rising darkness in the north, human kingdoms at war with each other and a motley group of unlikely heroes tasked with saving the realm. Whether you’re totally new to Williams’ work or have read Memory, Sorrow and Thorn, you might like to read an excerpt from Shadowmarch (click to read!). MS&T is my favourite series ever. Personally, though, I won’t compare Tad to Tolkien, because to me the outstanding thing about Tolkien is the amount of work he put into creating Middle-earth. And while I like Tad’s worlds, he doesn’t get “stuck” in one the way Tolkien did (and I do, too), so there can’t ever be quite as much depth to Osten Ard’s and Eion’s histories and languages – but Tad writes the better characters, and if I had to choose between the two, I’d pick Tad any day. Excellent post. I haven’t read his work, but intend to now. Here is another author who never seems to get mentioned much, but sounds like he should. (I’ve been lamenting the ‘sameness’ of popular authors and how only a handful ever get talked about). Thanks for visiting my blog and subscribing, lovely to meet you! Tad Williams is one of those authors I’ve always loved, but find tough to recommend because I couldn’t quite articulate why I thought he was so great. This is spot-on! There are absolutely shades of Williams in GRRM’s work–and Williams is one of the rare authors who can create worlds, plural, with that kind of depth and complexity. Great article. I loved M, S & T when I first read it as a teen, and later devoured Otherland, as well, but for some reason could never get into the Shadowmarch series. Made it about one third of the way into it and just lost interest, which is unlike me. Maybe it was too much of the same thing at the time I was reading it. I think I liked the others so much for precisely the reasons cited in your article: both reminded me of Tolkien’s dedication to his world, even though Otherland was very much a modern piece. Thanks for the “like” on my Tolkien post at http://tinyurl.com/chhxsas on my Soundscryer.com site, too. I appreciate it! Keep it up- looking forward to exploring your work and to seeing new stuff as it comes out. I’m going to have to read all of those books now. 🙂 You just wrote them in a very desirable way. I absolutely adore fantasy, so I’m now excited to try this new author. Thanks. Memory, Sorrow, and Thorn leaves most other “epic” series in the dust. While there may be many elements borrowed from Tolkien and other classic sources, it has become a classic in it’s own right, never wallowing in trite characterizations. It owes much to real world anthropology, with its focus on cultural understanding (or misunderstanding), and this helps ground the many races in reality. The only problem with the series is that it will raise your expectations of what a fantasy novel should be like, to the point where you won’t be satisfied with anything less! Tad Williams sounds familiar but I haven’t read anything by him. I’ll check it out. Thanks. Well, you’ve convinced me to try it. It’s been on my to-read list since the first time I saw Patrick Rothfuss talk about, but you make a more convincing case than a drive-by author mention. Interesting. The only thing by Tad Williams that I’ve read is his Otherland series, which is essentially cyberpunk dressed up in a fantasy suit of armor (I mean that in a good way). I might have to check this series out. You’ve certainly convinced me to read this series. Particularly, because I’m fed up with the typical fantasy series, which has made me skeptical about the genre. But I’ve actually not heard about this before and it sounds mature enough… I’ll give it a go. Thanks! Tad Williams cemented his position as one of my favorite authors with Memory, Sorrow, Thorn…I really have to get around to re-reading it. I’ve learned over the years that where epic fantasy really shines (ie. Tolkien, Williams, Jordan etc) is during the re-read. I enjoyed Tailchaser’s Song, War of the Flowers, and the Shadowmarch series, but nowhere near as much as MST. Funnily enough, I’m actually re-reading MST at the moment and I’d like to echo your sentiments about it really shining during the re-read. What especially strikes me is just what a huge debt George R R Martin owes to Tad Williams and how no one ever seems to mention this! Actually, these series of books were inspired by the Gormenghast Trilogy.